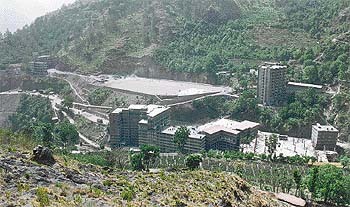 An overview of the Baru Sahib complex. IT offers an amalgamation of spiritual and modern scientific education. Here you have schoolchildren getting up much before dawn to attend the 4.30 am prayers at the gurdwara and you also have them devoting hours to a variety of sports activities. You hear them melodiously sing shabads with their fingers moving nimbly on the harmonium and you also see them deftly tapping computer keys. 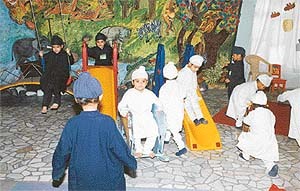 Though both boys and girls are traditionally attired in a long shirt and churidars along with a patka or turban covering their head yet they are also well wired with the rest of the world and fluently converse in English, Hindi and, of course, Punjabi. Finally, they are not only well versed with tenets of Sikhism but also excel in the academic curricula. And they have the results to confirm it. All 60 students who appeared for this year’s Class X CBSE examination, secured a first division. Six scored above 90 per cent and 34 above 80 per cent. This is Akal Academy at Baru Sahib. About 30 km from Rajgarh and 65 km from Solan, you find this residential school, housing 1200 students from nursery to Class XII. Nestled in the solitude of mountains and far removed from the distractions of city life, this temple of learning strives to fulfil the vision of Sant Attar Singh, who in the 1920s wanted an institution in the Himalayas from where young children equipped with knowledge would spread the message of peace around the globe. The dream was partially realised when his Harvard University-returned disciple Sant Teja Singh set up a gurdwara here in 1956. And it was finally fulfilled when the present school was established in 1987 with just six children by Sant Teja Singh’s disciple Baba Iqbal Singh, former Director of Agriculture, Himachal Pradesh. Now besides the school and the gurdwara, the Baru Sahib complex, spread over about 400 acres, boasts of a 50-bedded hospital, 12-storeyed building for the staff and an ashram for the aged and orphans, all run by the charitable Kalgidhar Trust, headed by Baba Iqbal Singh. The complex, you find, is largely self-sufficient: there’s a petrol station, post office, bank, buses owned by the trust, orchards`85 at a distance you even spot cement bricks being made for some construction on the premises. Kindergarten students enjoying a break in fantasy land. Enter the grey school building, and you get impressed by all that touches your eyes. In fact, at first the modern and techno-savvy set-up seemed incongruous with the conventional outfits of the children and the religious spirit pervading the institution. But then you forget that this blend of progressiveness and traditionalism is precisely what the academy is aiming for. Your attention and admiration is drawn to the colourfully designed kindergarten section spilling with toys, four spacious laboratories, well-equipped computer room, state-of-the-art media room, language lab, art and craft corner, fantasy land, music hall, a class for dyslexics, etc. There’s a book-binding section and a printing department too. The well-stocked library with 34,000 books, which includes latest encyclopaedias, reference books and popular fiction for children could easily be placed as the pride of the institution. The academy, emphasising on the spiritual, mental and physical growth of the child, has also made adequate arrangements for both indoor and outdoor games like badminton, table tennis, lawn tennis, cricket, basketball, etc. The open-air games are held in a large playfield with a 400-metre track. A part of the building accommodates as many as ten hostels. Led into the junior wing, one finds five-year-olds enjoying a siesta around 3 pm. While the children slept soundly on their double bunk beds, their caretakers also rested in the same room. Each caretaker has been assigned to look after eight tinytots. Any reservations you may have about children leaving home at such a tender age are brushed aside with the explanation that students who come in after Class V "bring a baggage which is difficult to shed." Catering to the large student strength, the hostels have adequate support of mechanised laundries, boilers, generators, etc. The messes too, like the rest of the school, were spotlessly clean and possessed the latest in infrastructure. A look at the weekly menu chart, and you were pleasantly surprised at the variety offered: pizzas, burgers, stuffed paranthas, French fries in addition to the regular well-balanced vegetable khana. What more, as many as 50 different kinds of sweets are served to the kids in a month. Offering a blend of traditionalism and modernism, the academy brings excellent results every year. Upon completing the round of the school, just three words stay with you: discipline, dedication and devotion. Adopting a highly disciplined way of life, the sewadars, staff and students have dedicated themselves to the devoted cause of imbibing and disseminating knowledge. Besides the regular teachers, some of whom are from down South, there are committed voluntary workers who are the strength and backbone of the academy. Devinder Singh and his wife, Neelam Kaur, the present Principal and Vice-Principal of the school, respectively, inspired by Baba Iqbal Singh, gave up their careers in medicine in Delhi to join the academy around eight years ago. This devoted pair, who like other voluntary workers are always attired in white, do not even take the token honorarium for their relentless work. Another member of the faculty, Amarjeet Singh, a PEC graduate who had gone to the USA, took the decision to join the academy five years ago when he found there was no end to the rat race. The academy, which charges about Rs 40,000 a year per child, has 125 students coming from different parts of the world. About 65 come from the USA alone. 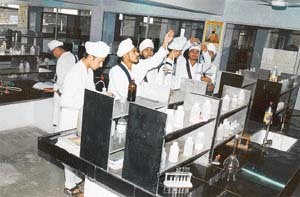 The academy, through 21 of its branches in Punjab, Haryana and UP, offers education to 20,000 students. Thirtyfour-year-old Sukhraj, who heads the academy at Muktsar, says that though most of the students at the academies are Sikhs, children from other faiths are welcomed too. These students, however, have to keep their heads covered. Her school has 10 per cent non-Sikhs. Contrary to apprehensions, she says, "We are not out to make babas and ragis out of our students. We instil in them confidence and respect for their culture, which fortunately makes them give up herd mentality." Three of her six students have cleared the CET. While many outsiders may find the regimen and discipline at the academy too harsh, the administrators feel they cannot show any laxity in the rules, which have been framed after much thought and consideration. If the children are woken up early to attend prayers, not shown regular TV programmes but only the selected and edited ones, if interaction between senior boys and girls is discouraged and if you find no mirror in the whole complex then there’s some rationale behind it all. An environment is created to help children raise their will power and concentration level. "The ground has been prepared," in the words of Baba Iqbal Singh, "for the right paniri to sprout."